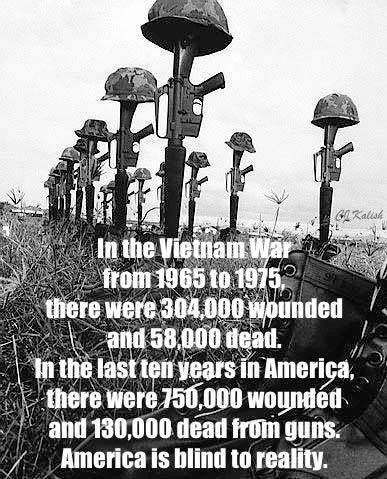 I have been thinking about the Viet Nam war lately since I am dealing with my brother's difficulties with PTSD, depression and Parkinson's Disease, results of his time spent in that horrible war. He has suffered terribly ever since he came back to the States after the war. It left him with life long emotional and phsychological scars and now a physical disease that many think could be caused by exposure to Agent Orange. He is too young for all of this trouble. It is costing him, the VA system and his health insurance policy a lot of money. It is causing terrible stress on him and now on the rest of the family as we all try to figure out how he can live with the disease as it gets worse. The total national hospital costs associated with firearm assault injuries ballooned to almost $700 million in 2010, according to a new analysis by The Urban Institute. And the bulk of those costs—almost three-quarters of them, to be more precise—aren't being paid for by the perpetrators, victims, or insurance companies, but rather by the American public. "Most of this cost is paid for by the public, either through public insurance programs such as Medicaid or as uncompensated care for the uninsured," the Institute said in its report. "In a time of restricted public resources, these findings suggest that significant public resources could be saved or redirected if effective gun-violence prevention strategies could be identified." "The purpose of this study was to dive into six rather different states and see if the pattern was there in all of those very diverse states," said Embry Howell, a senior Health Policy fellow at The Urban Institute. "And it was. While there's a range, it's actually a pretty tight range. Most of the costs are coming straight out of state Medicaid budgets, or even local hospital budgets." The analysis also found that gun assault injuries are disproportionately concentrated among young males—young men aged 15 to 34 accounted for 70 percent of such injuries. And young black males are the largest victims; in each of the six states surveyed, black males had the highest rate of firearm assault injury. As the number of gun stores continues to grow nationwide, and evidence continues to surface that more guns might not actually lead to less crime—or hospital visits, for that matter—it's important to bear in mind that the costs of gun violence aren't merely a burden on those directly afflicted, but also the wider public. The News21 findings are compiled in the most complete database to date from records obtained from 49 state health departments and FBI Supplementary Homicide Reports. I was on the cusp of adolescence. Just a kid participating in a popular American ritual: hunting, firing a gun. To hunt, to fire a gun is to have your imagination tangled up with fantasies of power. A fatal accident makes a mockery of these fantasies, leaving the unlucky fantasist exposed to the deeper randomness of life and the terrifying fact that so much of our experience is beyond our control. It’s as if the world you inhabit (in my case, a rural field; in hers, a shooting range) is suddenly shown to be only a stage set with one of those old-fashioned painted backdrops, and your inadvertent, violent act has torn a gash in the scenery. “Accident” steps through it. “Accident,” which is such an innocuous and useful term in most contexts, but now for the child is suddenly a terrifying word, perhaps even the name of the grim and mocking god who rules this new reality. With the accident that took my brother’s life, my whole world was changed, utterly and to its core. I survived, grew, and perhaps even thrived. But I never healed. And my survival had as much to do with luck as anything else. Part of my luck was to discover poetry, which has sustained me through a lifetime. In this impossible situation, I hope that whatever is said to that girl is not said in order to relieve adult anxieties in the face of horror. And this also, as a deep longing out of my own, long-ago shame and isolation: that someone larger and trusted by her, someone who pretends to understand this bewildering world, will hold her and give her permission to feel what she feels and, in some way beyond words, give her the courage to endure what she must endure. There isn't much more to say. Lives are lost every day senselessly due to all kinds of accidents and diseases. As a country we work hard on cures or prevention. It is beyond explanation that, given the facts and the lives lost, we do nothing about the death toll from gunshot injuries. It's also past time to act and deal with the role guns and gun violence play in our every day lives. When more Americans die from every day gun violence than military members serving in wars, something has gone terribly wrong. Reasonable gun owners and reasonable non gun owners can come together to prevent gun violence without the divisive nature of the current conversation. As with anything else, with rights come responsibilities. We are shirking our common responsibilities to keep our children and our communities safe. Where is common sense? A 7-year-old is in the hospital with a gunshot wound after authorities say he was shot over the weekend while at target practice in El Dorado County. The incident happened along remote Bottlehill Road outside of Georgetown. El Dorado County Sheriff’s deputies say a bay area family set up a shooting range on their property. One of the two people shooting at the targets was a 7-year-old boy using a .22-caliber bolt action youth rifle. Again, where is common sense? It is the last question that should most concern us. There’s not much you can do about individual lack of judgment. Some people will always be idiots. Some companies will always be idiots. But a country and its laws should be an expression of a people’s collective wisdom. So for a country to be idiotic says something sweeping about national character. And where gun laws are concerned, the United States of America is — individual dissenting voices duly noted and exempted from the following descriptive — dumber than a bag of bullets. This, after all, is the country where you can take a gun into a bar. Where you can erect a shooting range in your own backyard. Where a blind person can get a gun permit. You think it’s insane that Arizona allows a 9-year-old to shoot at a firing range? ABC News reports that one in Texas allows them to do so at age 6. God bless America. We legislate against Sharia law in places where there are no Muslims, much less an inclination toward Sharia. We pass laws to curtail election fraud despite the fact that election fraud, as a practical matter, does not exist. Yet we endure a yearly toll of gun carnage that makes civilized people in civilized places shake their heads in wonder and our only action is inaction. Dear readers. I published this only so you could see this offensive comment from a gun rights extremist who apparently thinks some people deserve to be shot.